Secretary of State for Business, Innovation and Skills Vince Cable has given his support to the Business Visits & Events Partnership's recently launched Meetings & Events Manifesto for Britain. 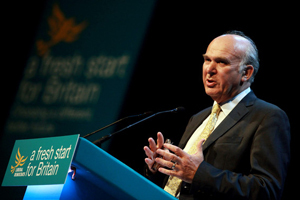 In a letter to BVEP chairman Michael Hirst, business secretary Vince Cable recognised that business visits and events generate wealth and employment. He wrote: "[Events] play an important role in showcasing the strength of the UK’s overall economic offer to the global business community that is key to our pipeline of inward investment and to promoting our sectoral offering." Cable added he had asked his officials to work with UKTI, the Department for Culture, Media and Sport and Visit Britain to develop programmes to support the sector. Hirst said: "As a result of a concerted campaign by the BVEP and its members over the past six months, we are now seeing a growing level of government support for our industry and a much clearer understanding of what more the sector can deliver to help achieve their long term economic and social objectives." The response from the business secretary comes ahead of an events industry reception at the House of Commons on 20 October, which takes place during National Meetings & Events Week. The event is expected to attract 150 guests, including MPs and industry leaders. The meetings and events manifesto will be presented again at the meeting, following its launch in June. It calls for support for the events industry through initiatives such as tax measures and investment.